Jeff Andra pitched in the Giants organization from 1997 to 2002, going 26-30 with a 4.56 ERA. Now a Financial Advisor at Edward Jones in Kansas City, he kindly answered my questions about baseball cards. "I did collect cards when I was younger. I would say it was my #1 hobby and where all of my allowances got spent. I haven't done so since high school. I'm not sure where most of them are. Probably in my parents basement. I need to look into that so they don't get thrown out. My favorite card is probably my first pro one which was in Salem-Keizer,OR in 1997. The pic isn't great but there is something about your first card. I also like one I had from Bowman. It has me in an actual SF Giants uniform in Spring Training which is nice to see since I never got any official time in the big leagues. Interesting stories...not really. I just remember guys would always try to do the staged photos of robbing a home run or putting a good swing on a ball and it never looked quite right. The action photos always turned out better. I still get some cards sent to me by collectors to sign every once in a while and it takes me back to the fun days of playing in the minors which has now been 10 years past." I have one card of Brian Ahern, from 1989 Best. Playing career: Brian Ahern pitched in 100 games in the Royals organization from 1989 to 1993, going 33-38 with a 3.95 ERA. A fuller account of his career can be found at The Greatest 21 Days. Where he is now: A Financial Advisor at Merrill Lynch. Google Autocomplete results: Brian Ahern Baseball is second when you type Brian Ahern B, between Brian Ahern Bio and Brian Ahern Biography, which refer to a Canadian musician. There are no references to the ballplayer on the first page of Google results for Brian Ahern. Another prominent Brian Ahern is working on cold fusion (with some limited success) at MIT. Coming up next: The next profile will be Gibson Alba. I have one card of Sal Agostinelli, from 1989 Best. Playing career: Catcher Sal Agostinelli played nine seasons in the Cardinals and Phillies organizations, hitting .245 with 3 HR and 191 RBI. A fuller account of his career can be found at The Greatest 21 Days. Where he is now: The International Scouting Director for the Phillies, he also owns Sal Agostinelli’s Long Island Baseball in King’s Park, NY. Google Autocomplete results: He is ninth when you type Sal A, between Sal Arnuk, an investment banker, and Sal and Richard, a comedic prank-calling team. There do not appear to be any other prominent Sal Agostinellis. Coming up next: The next profile will be Brian Ahern. I have one card of Dan Adamson, from 2011 Topps Pro Debut. Playing career: Outfielder Dan Adamson was the tenth round draft pick of the Astros in 2010, and has slowly progressed through their system. Where he is now: He played in only four games in 2012, at Class-A Lancaster, going one for twelve. Google Autocomplete results: He is fifth when you type Dan Ada, between Dan Adams Facebook, referring to one of many results on the social networking site, and Dan Adair, former drummer for 3 Doors Down. The first result when you google Dan Adamson is not the ballplayer but the Vice President, Regulatory Affairs at SEIA. Coming up next: The next profile will be Sal Agostinelli. Night Owl Cards is the consistent winner of the Blog-of-the-Year awards, and rightly so, but he's got some real competition from a pretty new blog by a 21-year-old out of Chicago. If you're not reading Dime Boxes - The Low-End Baseball Card Collector's Journey, you're missing a lot. Nick and I recently completed a trade and I got a whole bunch of awesome cards in return. There were a bunch of cards that appear to have been giveaways at a 1999 Tampa Bay Devil Rays game. Here's a great card of Houston, catcher for Chicago. "Has feel for bat head." That just sounds dirty. Steve Minus is a great baseball name. There have been quite a few cards of pitchers and a sunflower-seed-tub of baseball through the years. They still haven't gotten old. They really had some non-prospects in the old Topps Total sets. The Key to Success was usually some great baseball skill a player had. For Nick Trzesniak, who "rapped .237" in 2002, his key to success was "Brings positive energy to the ballpark." Mike Esposito was a white pitcher for the Colorado Rockies. Topps somehow got him confused with Darwinson Salazar, a black hitter for the Kansas City Royals. This is my favorite card of the lot - I'd seen this card on several blogs in the past and am glad to finally have it. Looks like someone dressed as Dustin Hermansen for Halloween and made out with a great haul. Here's a great shot at Yankee Stadium. Not sure if it's clear in the photo, but the fans' faces are airbrushed a bit, and one of the kids is wearing a Mariners' shirt. This is a fun card from a set I've never seen before, except on other blogs. I'm a big fan of cards with funny photos. I have one card of Steve Adams, from 1990 ProCards. Playing career: Steve Adams pitched eight seasons in the Pirates and Orioles organizations, going 38-25 with 9 saves. Where he is now: Anyone know where Steve Adams is now? Google Autocomplete results: He is first when you type Steve Ada, ahead of Steve Adubato, an author. There are no references to the ballplayer on the first page of results; the first is a guitarist. Coming up next: The next profile will be Dan Adamson. I have one card of Hunter Ackerman, from 2011 Topps Pro Debut. Playing career: The Cubs fourth round pick in 2010, pitcher Hunter Ackerman has struggled in the minor leagues, going 2-6 with a 5.14 ERA in 36 games over three seasons. Where he is now: He started 2012 in his third straight season of AZL Rookie League ball, but after four solid games he was promoted to Class A Boise, where he went 1-1 with a 7.66 ERA in nine relief appearances. Google Autocomplete results: He is third when you type Hunter Ack, between Hunter Ackley and Hunter Ackley Review, which refer to boots. The first entry when you google Hunter Ackerman is not the ballplayer but a musician. Coming up next: The next profile will be Steve Adams. I have one card of Lanny Abshier, from 1987 ProCards. Playing career: Shortstop Lanny Abshier played in seventeen games in the Angels organization (Salem and Palm Springs) in 1987, going 4 for 28 with 3 RBI. Where he is now: Working in construction and a youth baseball coach in Florida. Google Autocomplete results: He does not appear in Google autocomplete results. There do not appear to be any other prominent Lanny Abshiers. Coming up next: The next profile will be Hunter Ackerman. I have one card of Franklin Abreu, from 1987 ProCards. Playing career: Infielder Franklin Abreu played seven seasons in the Cardinals organization, hitting .242 with 4 HR and 206 RBI. Where he is now: Anyone know where Franklin Abreu is now? Google Autocomplete results: He is first when you type Franklin Ab, before Franklin ABC, referring to Franklin Avenue Baptist Church in New Orleans. The ballplayer is ninth on the first page of Google results; the first refers to a photographer. Coming up next: The next profile will be Lanny Abshier. Here is the last, and in my opinion, best of the minor league sets I bought over the last few months. (Next I'll be going back to player profiles, catching up on a bunch of players whose cards I have gotten recently). These cards are listed as "Bill Pucko Cards" and are sponsored by Price Chopper Supermarkets. The design is more interesting than most minor league sets, and there are a lot of action photos. The backs are also interesting. It seems that they asked everyone their "top outside interest". Todd Martin's was his fiancee, Tina. Kevin Coughlin's prize was his '85 Camaro Z28. Morgana, the "Kissing Bandit," makes an appearance. This is actually an error card - her name is actually spelled Morganna. Apparently she was a minority shareholder of the club. I thought it was cool to get a card of Murnane Field, having owned the book Good Enough to Dream, about the 1982 Utica Blue Sox. Finally, I enjoyed Mike Bradish's quote about liking Mark McGwire because he was "huge and massive". I wonder if he also like Jose Canseco because he was big and large. The Red Wings were the Orioles AAA team. No bat knob for Bill Ripken on this card. Dave Smith and Lee Smith combined for 60 saves in the major leagues in 1987. David Lee Smith hit .188 in 31 games at Rochester and never made the major leagues. Here is a weird card - two players, one of which wasn't even a Red Wing. Apparently these were two former college teammates at the University of South Carolina. The Mud Hens were a Tigers AAA team. Scott Lusader posed with a 666 bat on his 1990 CMC card, but three years earlier he wasn't established enough to pull a prank like that. There were two Jim Wrights who pitched in the major leagues. This is not either of them - this is the pitcher known as Ricky Wright in 1987 Topps. I traded some Red Sox cards to Thoughts and Sox and got some Red Sox cards in return, mostly Dustin Pedroia. As the scrappy, unshaven, Red Sox fan favorite, it is only a matter of time before he follows Johnny Damon and Kevin Youkilis to the Bronx. 1987 TCMA cards are a little taller and thinner than your standard baseball card. The Guides look like Blue Jays, but they were the AAA team of the Phillies. There is a nice variety of photography in this set, with some action photos and a variety of backgrounds. The biggest star in the set is Darren Daulton. Weird to see him in a dark blue uniform. 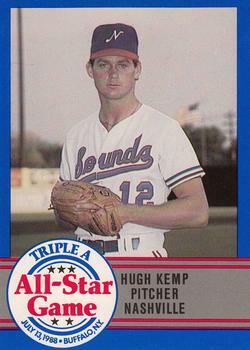 Hugh Kemp pitched eight seasons of professional baseball, mostly in the Reds organization, 74-62 with a 3.67 ERA. Now a consultant at Pactera and a baseball coach at Charlotte Christian, he kindly answered my questions about baseball cards. I have a card from Venezuela that is not me. It has me or my name as a left handed pitcher and I’m right handed. I also laugh that you can find some cards of me on EBay for several dollars. I wasn’t anybody. I like my AAA All-Star baseball card from the 1st annual AAA All-Star game, that was played in Buffalo. I don’t, but my son does. He has several boxes full of them. He also gets some every Christmas in his stocking, since he was born. He is now 16. Thanks! I don't have either of those cards, but here is one I do have from 1989 ProCards. Last of the ProCards set - New York Mets AAA team from Tidewater. I think of Bill Scherrer as the guy with the big curly afro in a Tigers uniform in his 1987 Topps card. Weird to see him with close-cropped hair and a Mets uniform. Rick Lundblade was the baserunner in the famous "potato caper". He is now a lawyer with the web domain oregontruckaccidentattorney.net. Outfielder Tony Scruggs played seven years of professional baseball, reaching the major leagues in 1991 with the Texas Rangers. Now an empathy coach in Los Angeles, he kindly answered my questions about baseball cards. One thing that comes to mind is just how "Assembly Line" photo day seemed. The well organized movement of people, from station to station, was a testament to a wonderfully pragmatic staff of folks, behind the scenes! I loved being in the short-lived, "Major League Debut" series. I love that not a month goes by, where a kind-hearted soul doesn't shower me with recognition and acknowledgment, by sending one of my few cards to sign! Truly grateful, to be seen! 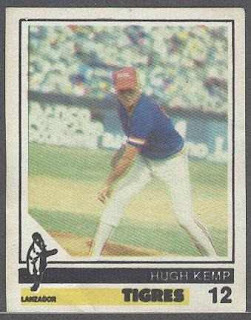 Topps "Major League Debut" card. I have cards that nice collectors enclose (as Extras), along with cards they want signed, and I keep them! At the same time, I'm not sure I'm in the same category as those, who devote an exponential amount of passion, for this art, that's truly inspiring!